Let yourself be whisked away to France's most iconic landmark with "Eiffel Magic." 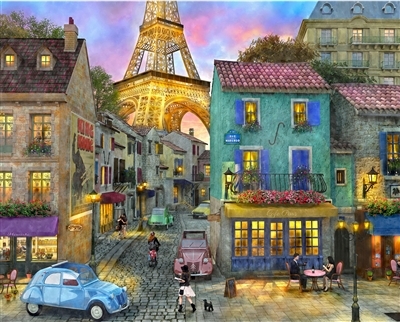 This 1000 piece puzzle by Springbok is a gorgeous illustration of the neighborhood streets near the Eiffel Tower. The beautiful blues & purples of the buildings and sunset contrast beautifully with the warm glow of the Eiffel Tower in the background. This puzzle was a little challenging, but a fun puzzle to put together. I did it with my older brother and it was so fun! I recommend this product. Puzzle is beautiful, but came with at least 2 roof pieces missing in new unopened sealed box from a retail store.